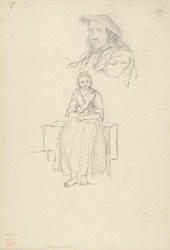 Sketch of the weaver and his daughter, drawn in August 1772 at Bowmore on Islay. Bowmore was a planned village on the east shore of Loch Indaal which was developed in 1768. The local population in the 18th century was engaged in the tartan weaving industry. The spinning and weaving were done in worker's houses. A number of views of the weaver's cottage were taken during Sir Joseph Bankes's journey here in 1772.